This past weekend I had the privileged of attending Saturday's races at Mid Ohio including the American Lemans race (Mid-Ohio Sports Car Challenge), USF2000 National Championship race #1 and Pirelli World Challenge Championship race #1. The weekend was sponsored by Honda (who did well this weekend, winning both prototype classes of the ALMS race and Sunday's Indy car race) and a buddy who works at Honda had tickets for the weekend and invited me to come along. It was the first race I had been to in over 30 years. 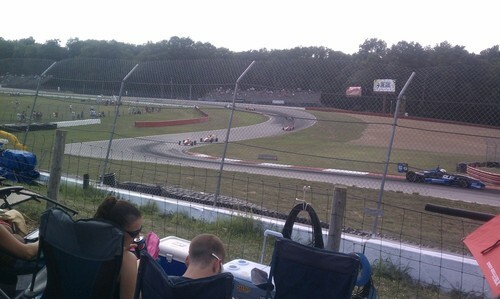 The last race I attended, I believe, was also at Mid Ohio, the Champion Spark Plug Challenge race (IMSA?) in the late 70's or early 80's when I was in middle school, I think. Yeah, I'm old. Anyway, in the spirit of the olelongrooffan from Hooniverse and his visits to the birthplace of speed, I kept my eye out for interesting cars in the parking areas of the track. We spent most of our time in the infield, wandering from corner to corner to take in the race from different vantage points. Along the way (and in the parking lot) we were greeted with a nice variety of nifty machinery. 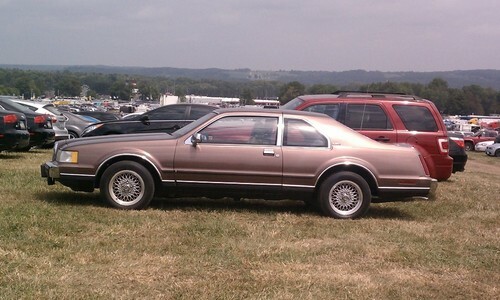 First up was this very clean, and wonderfully brown, Lincoln Mark VII LSC. Judging by the BBS inspired wheels, this is a 1990-1992. I've always liked the looks of these. I didn't bring my good camera, choosing not to lug it around, a bad move in hind sight. Instead I just snapped pics on my cell phone. It's got quite a decent 8MP camera, but it's still a phone camera and, as this shot proves, has limitations. Several came out like there was schmutz on the lens, but not all of them and I never cleaned the lens, so who knows. 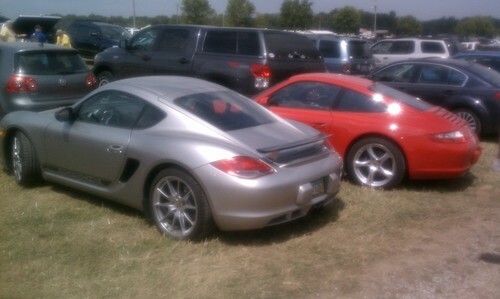 Anyway, I thought these two late model beauties from Stuttgart were worth an image, even if it is a bit fuzzy. 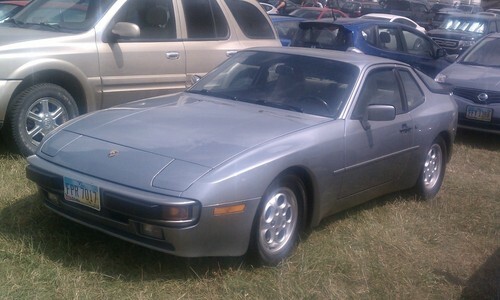 Just up the isle from the new and shiny Porsches was this clean, older 944. The 944 never did much for me growing up, no Porsches did frankly, but it was nice seeing this one now 20 some years old. 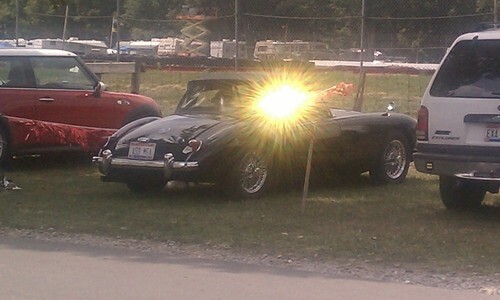 Another victim of the cell phone camera was this real clean 1959 MGA (I read license plates well). I must have caught the sun on the rear view mirror or something. Look how big that new Mini looks in comparison. Honda's S2000 was well represented along the road toward the main bridge to the infield. As a Honda sponsored event, they were well represented period. In fact, I saw more Crosstours and CR-Zs here than I think I had everywhere else to date. Several manufacturers were represented, both in official displays like the SRT display in the background (this was the first race for the new Viper GTS-R), or in owner's infield parking areas. This very clean early 60's Caddy was parked last in a row of newer Cadillacs. The wheel covers and extra wide whites are a bit too much for me. I can't really blame the phone camera on this one, I was clearly in too much of a hurry to catch up with the group and moved the phone before the shot. I didn't realize it until we were down the road a ways. The car in question was worth including anyways. 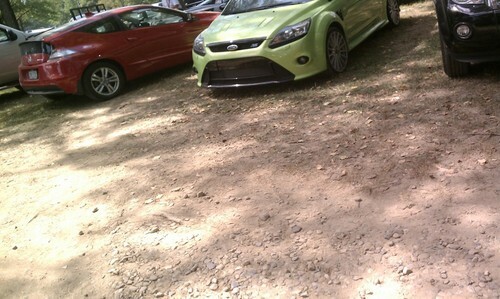 No, not the CRZ but the Europe only Focus RS Mk2 in Ultimate Green. There it was, hiding under the trees among the more common riff-raff in the infield. Man, I wish I had gotten a better shot. 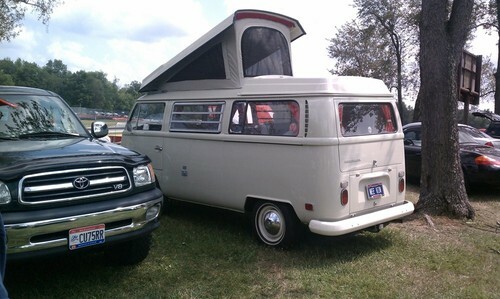 This pristine early VW Type 2 T2 camper (Westfalia?) looked like it just rolled off the showroom floor, not like it had been driven from Indiana like its plates indicated. It didn't even look like it could have been driven up the dirt path through the infield. This later Type 2 T2 was every bit as clean, if not quite as appealing as the older pop-top. 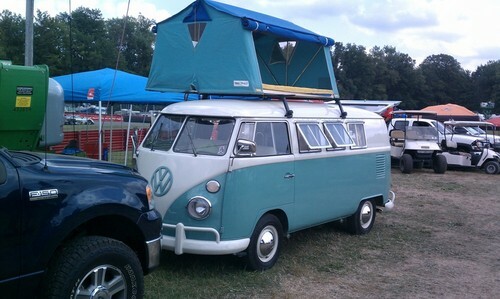 But the best was the awesome Type 2 T1 camper (or is it a Combi?) with what looks like a period roof top tent on a modern roof rack. My only disappointment was that they weren't up in the tent watching the race. They were parked right along the fence, after all (see the Porsche on the track on the left?). When was the last time you saw a single XLR, let alone 5 together and 2 of them V-series? 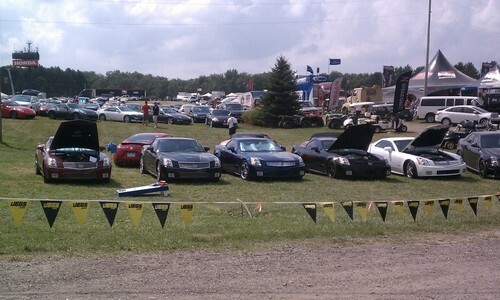 This was only half of the Corvette area. There must have been 100 'Vettes, and all but this '59-'60 were late model, C4, C5 or C6 models. This was an interesting car that I wasn't familiar with. 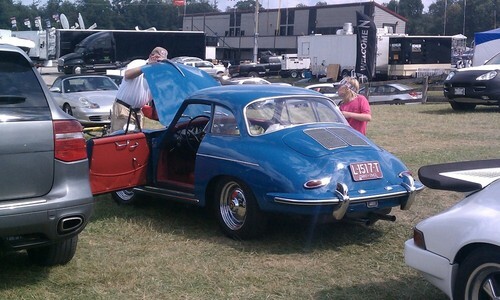 A 1962 Porsche 356 notchback. Built, according to the owner, to give a bit more head room for the rear seat. Only built in '61 & '62, the first few were converted convertibles and later in life many got converted back, as the rag-top was more desirable. One of a couple thousand made. 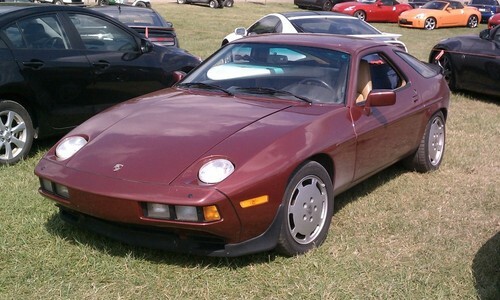 Another blast from the past was this 928. I didn't even see the 300 ZXs right behind it. I wish I had, I would have gotten a shot of them too. Can you spot the surf board? Oh, and yes there was a race going on, so here is a shot from each of the three races on Saturday. 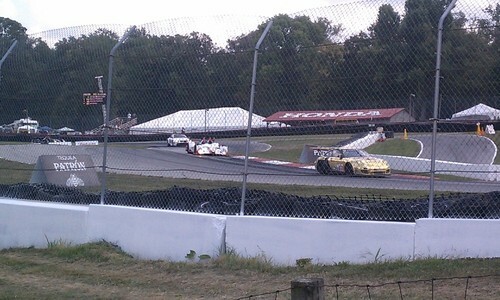 This is the ALMS race, with a couple of the GT cars and a couple prototypes heading into the front straight. These were all impressive machines, watching the prototypes corner was a treat as they simply changed direction with no perceivable body roll. I loved listening to the GT cars, the Ferrari 458s and BMW 3 series had a wicked wail, but the Corvettes had a low rumble that you could feel. The Vipers didn't sound good at all, they sounded out of tune, and maybe they were, they weren't competitive at all. These are the Mazda powered USF2000 cars heading into the esses after the long straight at the starting line. A series with one chassis and running sealed 2.0 liter Mazda engines, this one was all about driver talent. This is the first lap of the Pirelli World Challenge race. The cars have just come off the starting line up to the left and are headed into the esses. 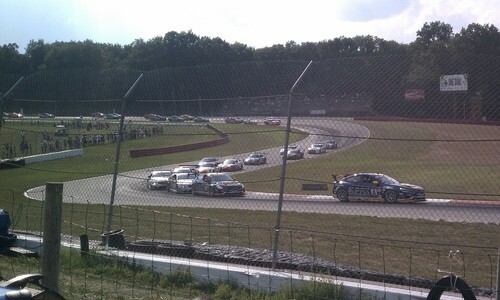 This looked like it was going to be a great race with 54 cars on the track ranging from the Volvos and Caddy CTS-Vs you see up front to a couple GTRs, A8s, Camaros, Mustangs, a flock of 911s down to a Kia Optima, Mazdaspeed3s and Civics. There was even a guy campaigning a Solstice coupe. Unfortunately we had to go, so we only saw a couple laps. According to their website, a Volvo took the GT class, an Acura won the GTS class and Mazda (Go Zoom Zoom!) won the TC class. All in all a fun day, even though it was real hot and we walked a lot. I hope to get back to another race before another 30 years goes by. Love the pics Doug! Such great cars! I hardly remember that trip years ago! I know we had Champion shirts with race info on them. Your tastes and mine are often similar - I always liked the looks of those VII Lincolns, too. 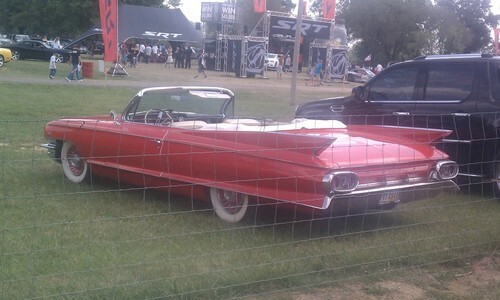 The Caddy is a 1961. Your grandpa had a 1962 which had the taillights in a vertical rectangle instead of a horizontal oval. The VW T1 is like the one Miller and Schaefer had, only this one is newer as indicated by the large parking lights and the bumper rail. 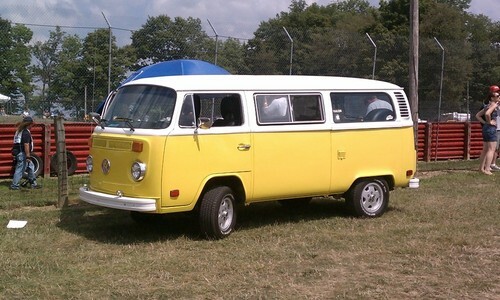 I don't believe they used the "Combi" name until the next body redesign. I'm willing to bet that the Focus RS is the one from Jalopnik a few years ago. An interesting man with great taste who lives in Chicago bought it. 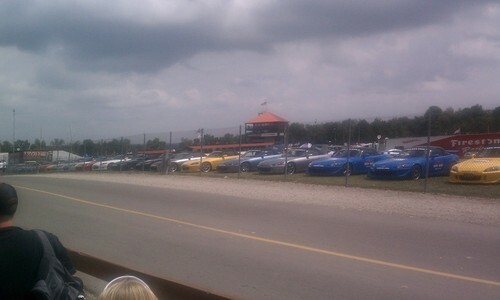 Great Pic of the Midwest Marauder XLR club corral. I'll be sure to share your link with the others. P.S. We actually had 7 at mid-ohio (Cadillac Marketing asked me to take ELWOOD over to their Cadillac Corral for a photo shoot) and currently have 14 registered for Artomobilia in Carmel, IN on the 25th. 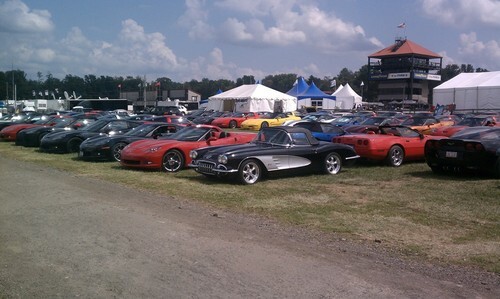 We'll also have just under 20 at Corvette Funfest next month.